No, I haven’t decided to abandon it, tied to the gates of a dog (magazine) shelter. It’s going to have a new online home. In 2001 we launched K9 Magazine dot com. In all the years we’ve been building and promoting websites, K9 Magazine’s was/is probably the one we’ve spent the most time on and by definition, the most money on. It’s had plenty of changes, new looks and a load of customisation. It has undoubtedly been good to us. It’s been the main source of subscribers to K9 Magazine and it has paid for itself many, many times over. But I made the decision it now needs to be dismantled. Around 2003 we got in to blogging and I thought it would make sense for K9 Magazine to have its own blog. For a while we ran a blog on the K9Magazine.com server but eventually I wanted the blog to have its own home so we invested in DogMagazine dot net. Since then the technology available to blog with has easily surpassed what we are able to do with the K9 Magazine site. I was reading a post by Seth Godin which had a pic of a store owner who’s sign was spelled wrong but he kept it up any way. Presumably because he had spent money on it and the idea of simply screwing it up in to a ball and throwing it in the bin would have been too painful. It was really at that point that I knew I had to take ol’ K9 out back and give it the bullet. I have been spending way more time adding content, news and premium features to DogMagazine dot net simply because it is easier, more search friendly, more user friendly, has more social features and generally has been a lot, lot slicker and simpler to operate. I spent less and less time with K9Magazine.com and before I knew it – or more to the point, before I was prepared to accept it – K9Magazine.com had been overtaken and I no longer could find a reason to justify running both sites side by side. In fact I even know we have managed to confuse people with running the two sites because I saw that when you type a search in Google for ‘K9 Magazine’ it suggests ‘K9 Magazine dot net’ which tells me that people have gotten mixed up with K9 Magazine and Dog Magazine dot net – which is the brand we gave to that particular site – for SEO reasons. The SEO mission was completed some time ago and confusing people as to the name of your brand is a pretty stupid thing to do. So now we begin the transition process, moving all the content from K9Magazine.com over to DogMagazine dot net and when that’s done, there will be no more K9 Magazine dot com. We will have just one focal point for the magazine. 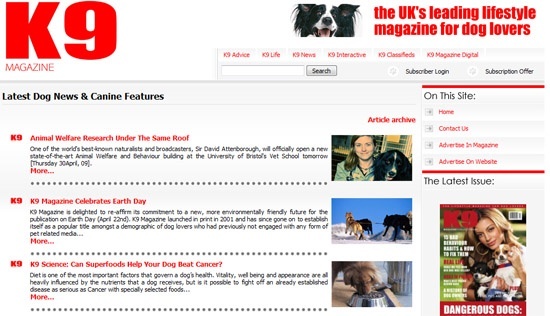 Already we have replaced the Dog Magazine dot net logo at www.dogmagazine.net and replaced it with the K9 Magazine logo. A lesson learned. Ignore sunk costs. Thank you Seth Godin.